Dedicated to the Multnomah. Some still walk where you have tread. The train is always heard, cutting through waterfalls and springs. Only by standing close to the noise of water can the sound be heard. How does this waterfall speak? Each splash that ricochets off a rock looks the same as the one before. Each is an individual word, related to, but not exactly the same word that came before. These words create a mist moistening her face, mingling with sweat. She licks her lips experiencing coolness combined with salt. A blue sky sticks light into the conversation, peering down through spears of cedar and fir. It’s been blue for so long. She can’t remember the grey. Below her, where the gorge meets the sound of the trains, people laugh in the sun, drink long from large cups, burn with play. They have been playing every day, forever. Here in the dark, next to the spring, the waterfall speaks to her. This is the place she had started from. This is where it began, before all the playing. The cool and dark always came from the ground, which now speaks the same words it always has, trembling next to her wet face. Nicely done!! I like this a lot and the first picture is very cool. Beautiful poem and as for the bridges they look like the same bridge in the two pictures? In view of the fact its National Poetry Month and I forgot, here is a lame attempt to make up for it a bit with a lovely poem from Elan Mudrow. Yes, it’s the same waterfall. This poem was inspired by a native myth and a people, which the waterfall is named after. He mourns, that man with the black banded, light colored coat . For her ? You are a perceptive one, aren’t you? Here in the dark, next to the spring, the waterfall speaks to her. This is the place she started from, where sound began, before all the playing. Cool darkness rises from the ground which now voices the same words that tremble upon her wet face. 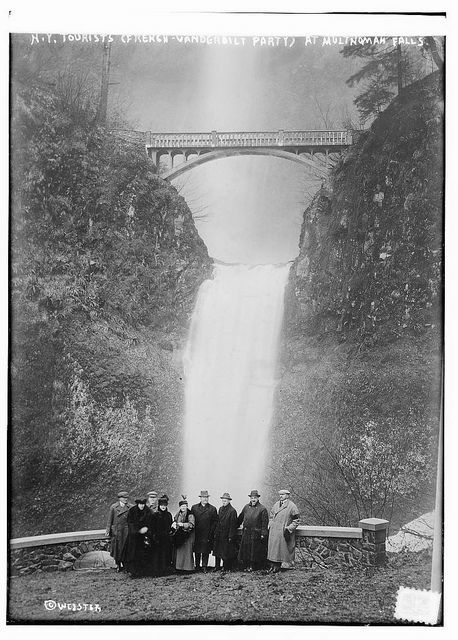 Is this Multnomah Falls up in Oregon? Looks familiar to me. Good poem. And, as ledged tells, in the icy times, “She” dressed in white, stands on the left side of the bridge, partially hidden by branches. You let us SEE such things with your Pen ! Yes. 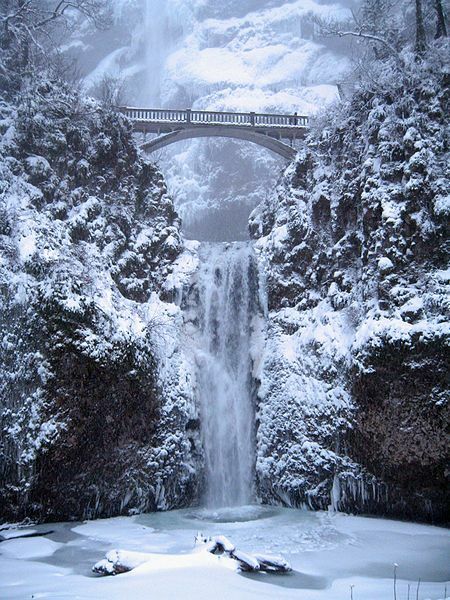 it is Multnomah Falls. Nicely done. I will give it some thought. A lovely way to end my day by finding this piece. Beautiful imagery sewn together with brilliant words. Wonderful! I like the juxtaposition of old photos and new words. Beautiful pictures and poem. I’ve seen those falls but only from a distance. Still they are entrancing. Interesting use of the two photos (old and new, I guess?) to bracket your poem. More and more I see the necessity of that image-to-word synergy. Thanks for sharing. I have enjoyed wandering in the forest of your pages. My toes have been tickled with mossy whispers and your well-woven webs of adjective have tangled in my hair. I am now following your path through the mountains of sorrow and look forward to reading the pages you scatter behind you like autumn leaves.